There's banh mi and then there's Cambodia's version of the perfect sandwich: num pang. They both have a lot in common, but there are a few subtle differences, as the owner of New York's Num Pang describes in his interview HERE, including the subtle differences in bread, ingredients (fresh vs. leftover) and toppings. 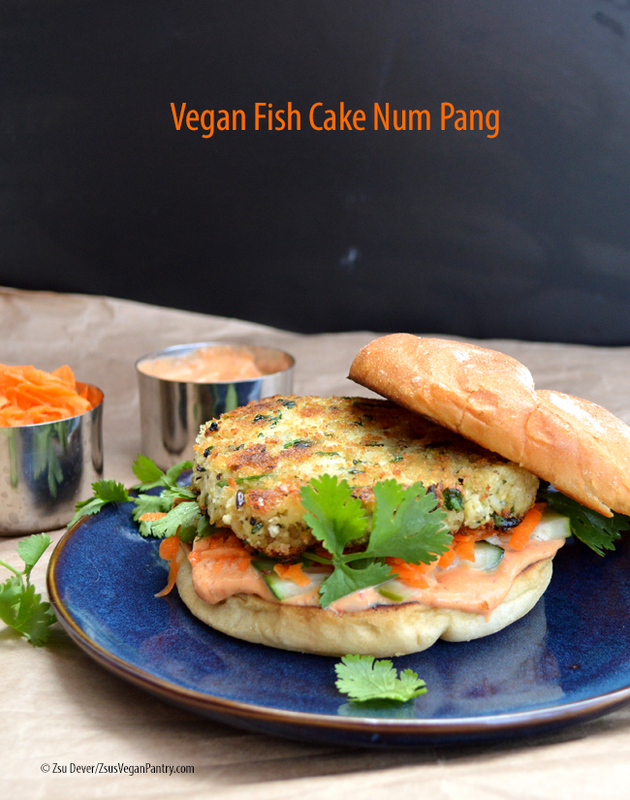 I wanted to try making it for myself and I chose to make a vegan fish cake for the bulk of this sandwich. I was inspired by the Jazzy Vegetarian's (Laura Theodore) Not So Crabby Cakes recipe, which I took for a test run last year and simply adored! For this version of fish cakes I used tofu, bread slices, hearts of palm and dulse. 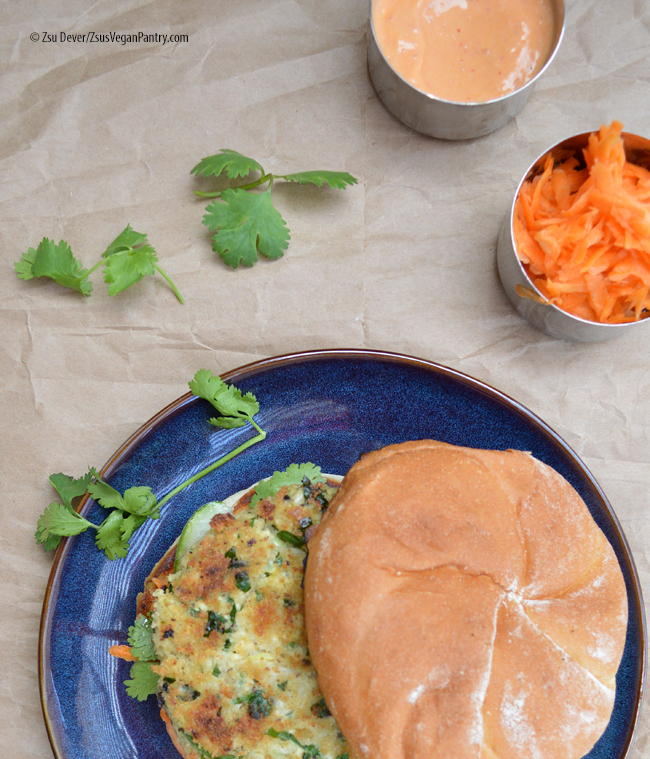 The toppings are homemade chili mayo, pickled carrots, cilantro and cucumber slices. If I could have made homemade bread using my Refrigerator Dough aquafaba recipe, this sandwich would have been even better, but as it was, it was pretty fantastic. You can air fry these babies or pan-fry them, as you wish, but don't skip on the toppings - they really do make this sandwich authentic and amazing. Natalie Cartledge! Congratulations! Contact me at zsu at zsusveganpantry dot com. 1. Carrots: Combine the sugar, vinegars, water and salt in a mason jar. Mix well until the sugar dissolves. Add the carrot and set aside for at least 20 minutes. 2. Cakes: Add the bread to a food processor. Pulse until ground. Remove and set aside in a large bowl. Add the tofu, hearts of palm, parsley, scallion, ginger, oil, coriander, dulse, cornstarch and zest to the food processor. Pulse into a coarse grind. Add to the bowl with the bread and season with salt and pepper. Set aside to firm up for 20 minutes. 3. Sauce: Combine the tofu, water, garlic chili sauce, vinegar, sugar, salt and pepper in a small blender. Blend until very smooth, adding a little water if needed. Taste and adjust seasoning. 4. Heat a large skillet over medium heat or preheat the air-fryer. Divide the fish cakes mixture into 4 portions and press into a patty. Dredge the cake in panko crumbs and fry in oil or air-fry until crisp. 3. 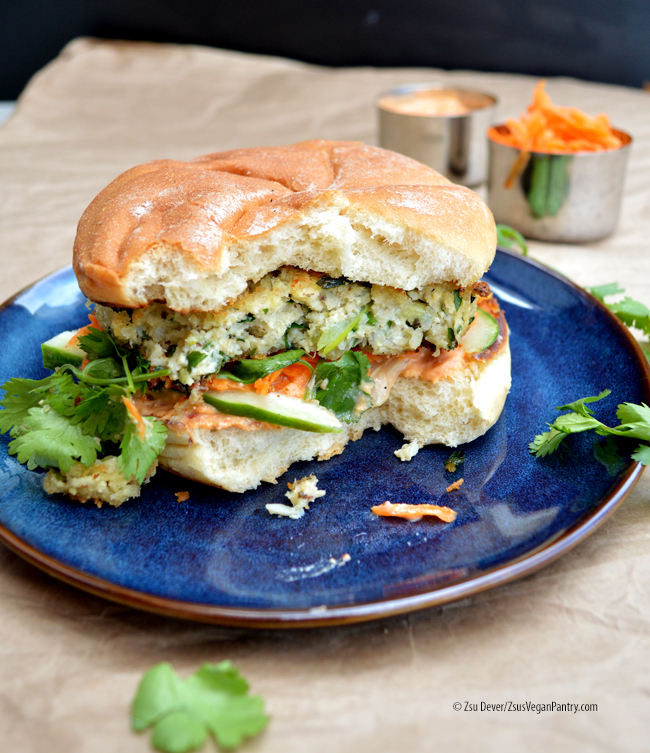 Assemble the burgers: bottom bun, sauce, cilantro, cucumber, cake, carrot and top bun. Serve immediately. © 2017 Copyright Zsu Dever. All rights reserved. I love it, too! Anything new sparks my interest.